Well I don't think that it is a big deal that it isn't an exact copy that is what makes it unique. Looks like a great guitar. Congrats!!! 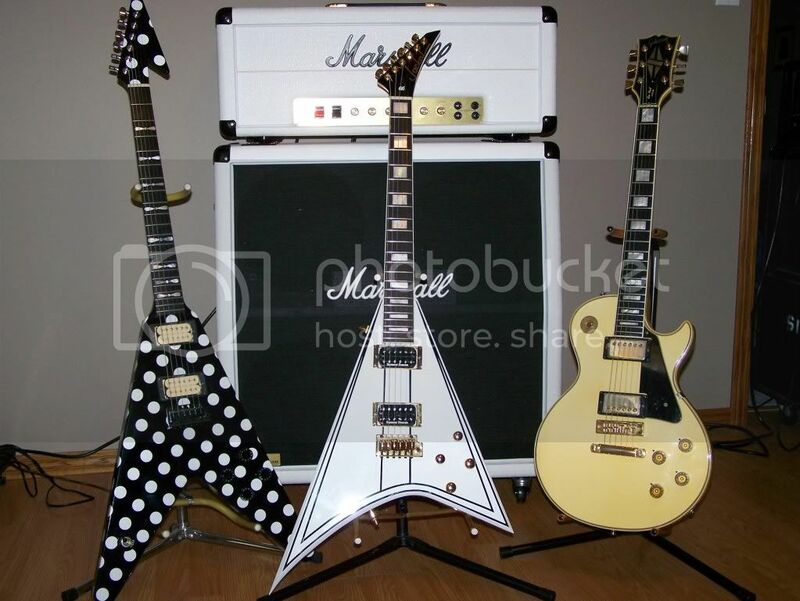 Maybe the NAAM guitar was supposed to have a smaller pickguard to accomodate the reversed tailpiece, and all this done to match the reversed shark inlays as well. Maybe this was an 'on purpose' thing between Randy and Grover. To basically 'reverse' the black jackson....even having the color to be 'White'...totally reverse or opposite to a black color. No...it's not a 'big deal'....but we happened to notice, we have an eye for detail and beauty....and Kev's guitar has got the detail and beauty regardless! i really never noticed it either, the changes between the prototypes and the production models. i belive were just cosmetic i am sure the pick gaurd is smaller i am sure because of simplified electronics contained on it (no tone wiring just straight volume front and rear) but man that roller bridge sure takes some getting used to its really tall. I'm posting as brief as possible because I'm in class right now, but, I based all my custom brass bits and pieces off of the only photos I have of the V - from the Clegg images and the black and white from the '83 NAMM show. Naturally be different than the guitars made currently, but I'm going off what resources I have. & let me tell you... the sustain is CRAZY on that thing! you sure know how to build 'em. Any more news on Mike? I have not heard from Mike in a very long time. I do hope all is well with him. I wonder when he will be up and running for business. He Could Play Like a Fly on Water for Fairies, Then He was The Beast. Exchange is now brutal MIKE WHERE ARE YOU!!!!!!!!!!!!!!! I may be able to save the US economy ! Heck, didn't realise the exchange rate now!! I'm down for a Jackal, & was going to get a Jackson RR55fr in the meantime, but thinking about getting a RR3 now, as they are much cheaper - leaving me the extra towards the Jackal. Anybody got a RR3 at all? Price wise they are pretty cheap. I've currently got a Zakk Bullseye Epi, but i'm ready for a change. especially with a trem. I think I am going to keep waiting patiently for my Jackal. I wouldn't sell it, as i'd like to build up a little collection of guitars eventually. My epi looks lonely on its own . Well, i've still got my Black Westfield Les Paul......had to start playing with something. Thought the RR3 would be a decent guitar, especially for he price. how much longer of a wait? is anything even official, as far as order list goes? and how much does one cost? i would love to order a pinstripe one. 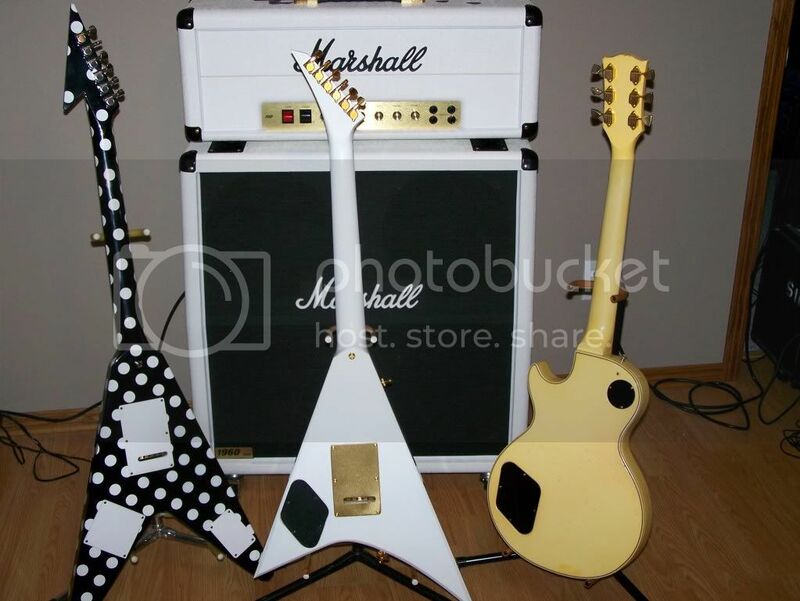 costs are all relitive, these are all one off handmade instruments. pinstripes are his specialty. the PDV is a relative newcomer to the fold. 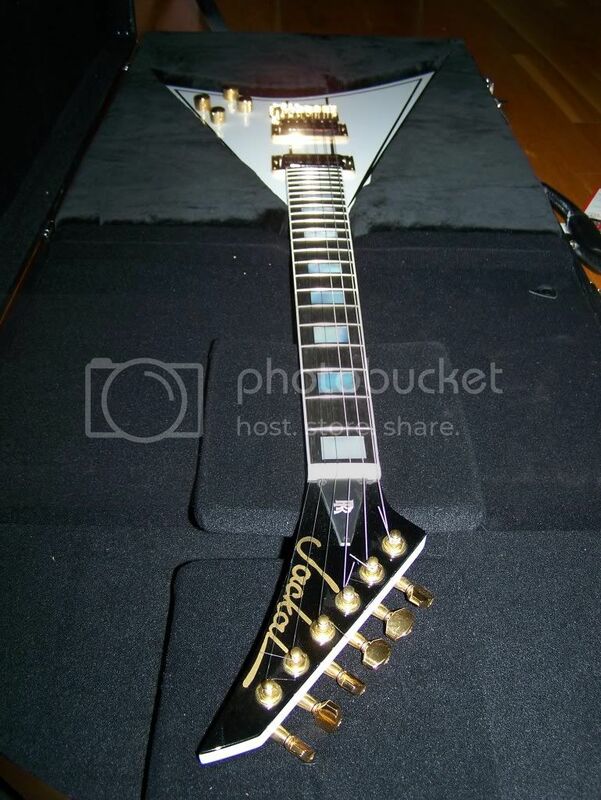 and the namm83 repro is one of a kind (mine) he can do anything you like he had a killer bolt on a while back. and he made a flaming skull guitar (like the hells angel backpatch logo. there are some guys that are getting priority positions on the list because they were slated for a build before his problems kinda kicked in. as spring approaches i think we will hear some more from mike. and he currently has no internet at home right now only at work. It's good to hear he should be up and running soon. I hope all is well now and He's gotten back on track. Thanks for all the talks Kev you really are a great friend. Anyway, I have a great connection at school a couple of nights a week too! If I haven't contacted you, please contact me at my email address with "RR.tk- your screen name" and I'll try to answer you as soon as time permits. I'll be in Florida from March 11-17 with my wife, so, I won't have any kind of computer access then. Let's hope this goes well and everybody gets some great stuff to play! Game ON! Keep in mind folks... I'm going to be making primarily Rhoads stuff for a bit, but, I can certainly do custom things too. THAT my friend is one beast of a guitar! It's great to hear from you Mike and see all is looking up. Good for you. That is one cool guitar, awesome work. I'll send you a mail. 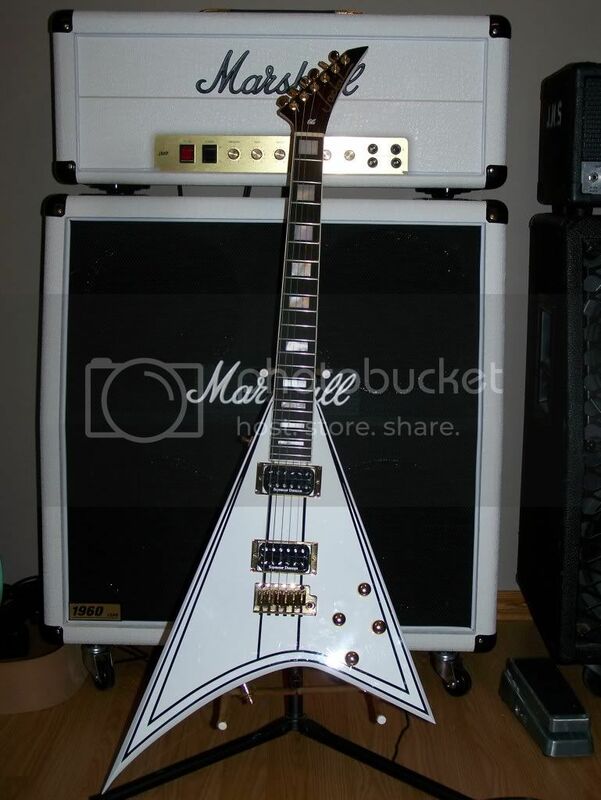 That is one hell of a good looking guitar! Is the paint job like Randy's or is it just black and white?